Looking to grow your business and generate more leads online? Fishing-NC.com can drive well-qualified visitors to your site through cost effective advertising that meets your business' needs and budget. Our advertising packages are available in a variety of options to fit any budget from $50 to $5,000. We understand the importance of return on investment to our advertisers and strive to provide advertising choices that perform. We welcome questions and feedback, please let us know if you have either. Every day more and more readers are finding Fishing-NC.com by word of mouth, our strong search engine presence, and all the other great sites that link to ours. Our readership consists primarily of resident anglers, but thanks to the search engines we also get a large number tourists looking for fishing and travel information. During 2009 our readership grew by leaps and bounds - we are now one of the most frequently visited North Carolina fishing websites. We gladly provide detailed usage statistics upon request. Fishing-NC also includes a fishing charter directory for all of coastal North Carolina. Our search engine presense for charter related search terms is very strong and a sizable percentage of all potential online customers pass through our site. Listings are available in two formats, featured listings and standard listings. Featured listings are displayed at the top of the page and include an image, standard listings are grouped below by region. Listings are available online though our Captain's Console. We have just recently launched our banner advertisment program and are excited to be able to offer image-based ads on both the right side of all pages and within each footer. Ads may be purchased for individual pages, entire sections, just for the homepage or any other combination of your choosing. Examples of common banner sizes and prices are used on this page and we are happy to help you create banner images if needed. All purchased banners are placed at the top of each page above any Google ads. We currently average over a 5% click through rate for similarly placed ads so expect good traffic. Please drop us a line if you would like more information. We are pleased to be able to also offer advertisers a very cost effective advertising alternative in the form of Google AdWords text ads. On the right side of each page there are blocks of text based ads that are part of the Goolge AdWords program which we republish. This is an excellent program and is far easier to set up than you might imagine. 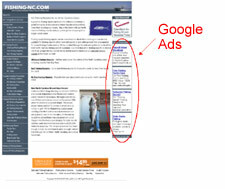 More information on our Google advertising is available from Google but let us know if you have questions. Our soon to be lauched monthly newsletter features top stories, special events, and other timely information. 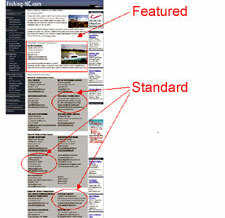 Readership includes hundreds of North Carolina fishing enthusiasts and all CAN-SPAM Act requirements are followed. We currently offer one advertiser per month the opportunity to include a 468 pixel x 60 pixel banner ad at a cost of $0.09 per active newsletter subscriber. Contact us for more information.